2018 Harley-Davidson Softail Fat Bob Dark Custom. Picture credits - Harley-Davidson. Submit more pictures. There is something about the steady pulse of power from an air-cooled Twin Cam 103� engine that works its way into a rider and won�t let go. Once you�ve experienced it you understand. Nothing else in the world of motorized transportation could be as satisfying. Price as new (MSRP): US$ 16049. Euro 17295. Prices depend on country, taxes, accessories, etc. Seat height: 590 mm (23.2 inches) If adjustable, lowest setting. Ask questions Join the 18 Harley-Davidson Softail Fat Bob Dark Custom discussion group or the general Harley-Davidson discussion group. Bikez.biz has an efficient motorcycle classifieds. Ads are free. Click here to sell a used 2018 Harley-Davidson Softail Fat Bob Dark Custom or advertise any other MC for sale. 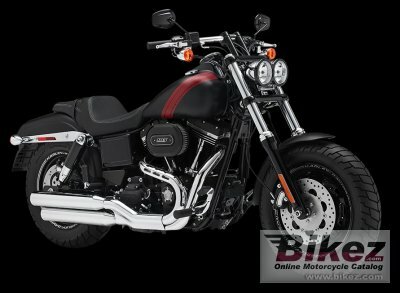 You can list all 2018 Harley-Davidson Softail Fat Bob Dark Custom available and also sign up for e-mail notification when such bikes are advertised in the future. Bikez has a high number of users looking for used bikes. Before you buy this bike, you should view the list of related motorbikes Compare technical specs. Look at photos. And check out the rating of the bike's engine performance, repair costs, etc.